Are you ready to step into a world of adventure on the big hoops? Giant’s 2019 Fathom 29 line is a great way to tool up for those longer, harder rides you have in mind. And you’ll have plenty of scratch leftover for accessories! The 2019 Fathom 29 line rolls out from Giant’s long lineage of mountain bike design and manufacturing savvy. With this know-how permeating Giant’s full range of XC bikes, you can now spend little and still get a pretty advanced bike. Giant Fathom 29 1 and 2 are a couple of fine examples of that. Fathom 29’s ALUXX SL-grade aluminum alloy frame is designed for both all-day comfort and for confidence on steep and rough terrain. 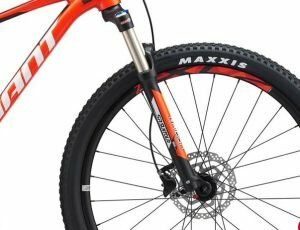 Of course, the tubeless 29er wheels will help you carry momentum with their well-known rollover ability, and the lightweight and tough Maxxis Ikon tires will deliver great performance on a variety of off-road surfaces. Fathom 29 1 – The more advanced build, which includes a more premium Suntour suspension fork, and an 11-speed 1x wide-range gearing setup for simplicity and performance in the rough. Quality components from leading brands like Shimano and KMC round out the build. Fathom 29 2 – Uses a 2x gearing setup with front derailleur, paired with a 9-speed rear cassette. A few of the components are a lower level than offered on Fathom 29 1, but the main differences will be the gearing setup and the level of fork performance. In true Giant tradition, the build options for Fathom 29 are premium relative to the bike line’s low price. Fathom 29 1 and 2 are equipped a good cut above entry level, with the Fathom 29 1 model checking in with somewhat more advanced gear than its more economical brother. We mentioned the difference in drive types – 1x versus 2x – and we believe that is the biggest consideration in comparing these two bikes. 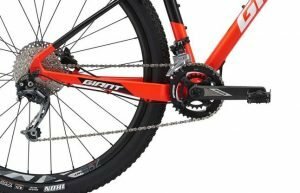 Mountain bikes with a single chainring in front are usually better able to handle rough jarring without losing retention of the chain. This may seem counter-intuitive, but the reason chains stay on single rings better than multiple ring is: Multiple rings are intended to have the chain move on and off them during shifting, so, by design, they do a less effective job of holding onto the chain during heavy jarring. A clutch-style rear derailleur helps to minimize this effect, and is key to good chain retention – note that both Fathom 29 models include this type of rear derailleur. Besides the drive, the brakes and hubs will be a more premium grade on Fathom 29 1. Cockpit components are identical between the two Fathom builds, consisting of reliable and lightweight Giant-branded parts. Giant’s Contact Switch dropper seat post comes standard on both models – an extremely useful feature when up turns to down, and vice versa. Shimano hydraulic disk brakes – one of the best mountain brakes out there – are included in each build; the slightly more premium M365 models on the Fathom 29 1, and M315 on the Fathom 29 2. Rotor sizes on both bikes are 180 mm front and 160 rear – a worthy combo for stopping the big wheels. Wheelsets include Giant XC-2 tubeless rims and Maxxis Ikon 2.2-inch tubeless tires with EXO sidewall protection – a fantastic combination for lightweight performance and upping your personal records. Giant Fathom 29 1 and 2 frames both employ Giant’s ALUXX SL-grade 6061 aluminum alloy with semi-internal cable routing, OverDrive tapered head tube for maximum stiffness and stability, compliance-tuned seat stay junction for a smoother all-day ride and XC-specific geometry with 69-degree head angle for confidently descending steep and rough terrain. Fathom frame sizes will accommodate riders from around 5’4” to over 6’8” tall; S, M, L and XL sizes are available. This relatively new model has not yet produced a huge amount of review material, but what we’ve seen has been mostly positive. Reviewers praised quick handling of the bike, its ability to transition turns well, and its comfortable riding position. Also mentioned was Fathom 29’s technologically-advanced alloy frame, neatly-tucked rear brake caliper, and its featured Suntour fork. Rider and reviewer feedback propped the Fathom 1 and 2 as very well spec’ed for their price bracket – an overwhelming plus of the Fathom 29 line, as we’ve determined. The Fathom 29 1 and 2 confirm Giant’s position as the preeminent manufacturer of high-value bicycles. 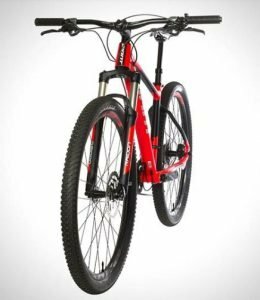 This line of hardtail mountain bikes is suited to novice-to-intermediate riders and is appropriate for a range on XC terrain, including pretty much any MTB surface type and grades that are less than extreme. At the core is Giant’s ALUXX SL-grade aluminum alloy frame – a culmination of Giant’s decades of experience building off-road bicycles. Frame geometry and design enhance compliance and stability for a comfortable and confident ride. The full-featured line includes Suntour suspension forks in front, tubeless Maxxis Ikon XC-specific tires with EXO sidewall protection, Shimano drivetrains and Giant dropper seat posts – pretty much turnkey for ripping your favorite XC circuits and beyond. Fathom 29 1 features a 1 x 11 gearing setup versus 2 x 9 on the Fathom 29 2 – riders looking for rougher trails will benefit from the former. Roll smoothly through rocky bits with tubeless 29er hoops and light-yet-tough Maxxis Ikon tires front and rear. Fathom 29, in either build, is a complete and balanced package, front to back. Looking for a solid, reliable, modern hardtail packed with design features and great components for a noteworthy price? The Giant Fathom 29 1 or 2 will keep your accountant happy and give the rider you have in mind a whole new world to explore. 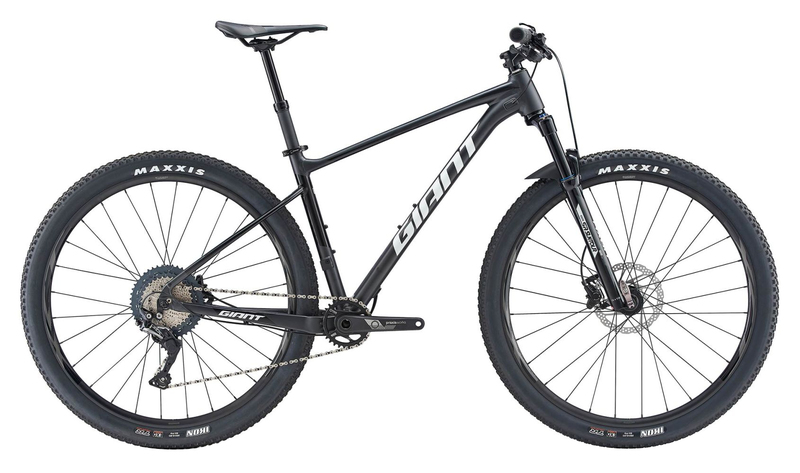 Novice-to-Intermediate XC riders will appreciate Giant’s thoughtful design, technologies, and execution of this economical 29er mountain hardtail. The Fathom 1 and 2 are worthy XC-oriented steeds that will accommodate most budgets and not leave a rider wishing for an upgrade.